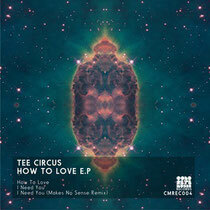 London-based producer, DJ and radio host, Tee Circus, drops the 'How To Love EP' on newly formed Concrete Music Records, set for release September 13th. Fresh off the back of a five week stint on BBC Radio 1Xtra as a Talent Resident, Tee delivers his first release of the year, a two-tracker comprising of 'How To Love' and 'I Need You', backed up by a remix from Food Music's Makes No Sense. Both tracks were crafted in London's Red Bull Studios and demonstrate Tee's penchant for bass infused house and garage, the type which heavily informed his musical taste when cutting his teeth on pirate radio in the late-90s/ early-2000s. ‘How To Love’ is a groove based roller built around warm chords, infectious vocal refrain and tension strings that gives it that nostalgic appeal. ‘I Need You’ explores a more off-kilter aesthetic, built around skewed synths and resonant bass. On the remix duties rising trio, Makes No Sense put their trademark bumpy twist on ‘I Need You’. Early DJ support is already coming from Gorgon City, Foamo, Redlight, B.Traits, Mosca, Monki, Zombie Disco Squad, Kry Wolf, Doorly, Hannah Wants and Marcus Nasty. Have a listen below.